I had high hopes of seeing the new operation on the public test server (PTS) this week but, alas, Bioware has pushed us to another week of farming the same old content. Oh wait, we did get a new button to push if we want to create a new character. At least there’s something new. Since we don’t have new shinies to play with this week, I thought we could do some speculation on what we can expect in the Terror From Beyond operation. Unfortunately, last week’s Developer Blog came a bit late for me to write about in detail so let’s discuss what Bioware had to say regarding the upcoming operation. The first thing that I am happy to see is that we are back to five boss encounters in the operation. I don’t know about the rest of you, but four just seemed too little even with the increased difficulty of the encounters. Of these five, one of them is going to be another puzzle encounter in keeping with the Operations tradition. At their worst, they are just tedious and buggy such as the Ancient Pylons in the Eternity Vault. At their best, they can be challenging and interesting like the hard mode Colonel Vorgath encounter. None of them, however, are exactly what I would call ‘fun’. Let’s hope that this operation puzzle proves different. A familiar face is also mentioned in the blog as an encounter in this operation. While we may have seen quite a few bosses in flashpoints and operations, I am going to place my bet on it being Darth Malgus. His end in the False Emperor flashpoint seems to leave room for a return. And besides, such a major character in the Old Republc lore shouldn’t go down in a flashpoint. He deserves to have an operation boss ending. 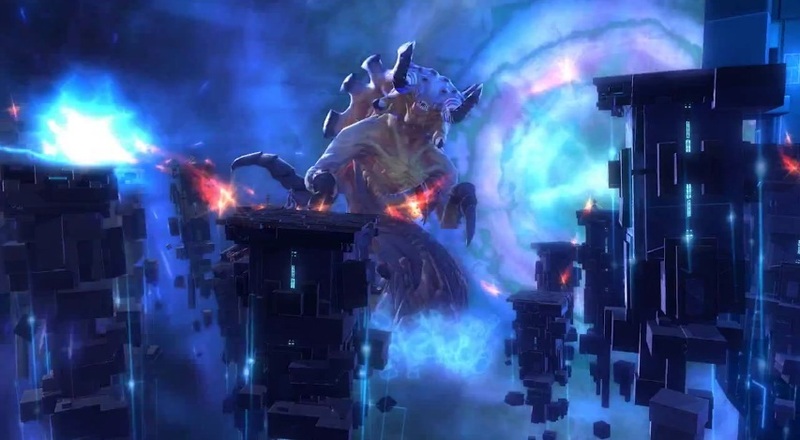 It seems that the Dread Masters are the masterminds behind the opening of the hypergates, but I don’t think we’re going to see their end just yet. I feel that it is too early in the cycle since their introduction to have the player base fight them. I feel confident that their ending will come in a future operation. Instead, we’ll probably face an agent of theirs, possibly in the form of a corrupted native creature of the planet Asation. The swampy terrain of the planet is just too good not to put in a local beasty as a boss. We see our heroes running in to this encounter in a strange multi-colored holographic projection. You only see five characters charging the boss in this capture but the full video shows a couple of people coming into frame before the scene cuts. I am wondering if this is the puzzle encounter that was mentioned or if it is just a normal encounter. Bioware states in their dev blog that the puzzle will consist of players going into an ancient Gree computer to repair it from within. Could this be a scene from inside the computer? This is the boss that the operations group is charging up towards, a Gree alien… wearing a scarf. 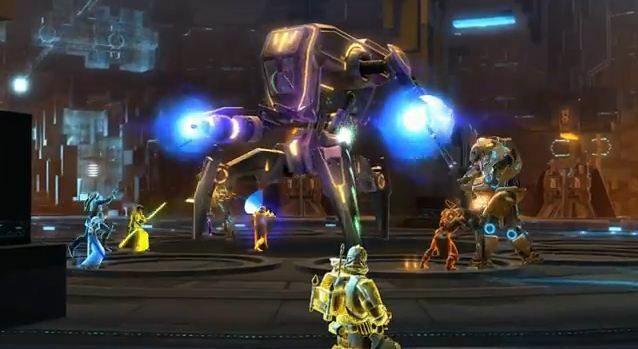 For those who have played the Republic side Black Bisector quest line, you’ll remember that the Gree sent droids to repair Coruscant’s infrastructure. Those droids, however, were only agents of the Gree. 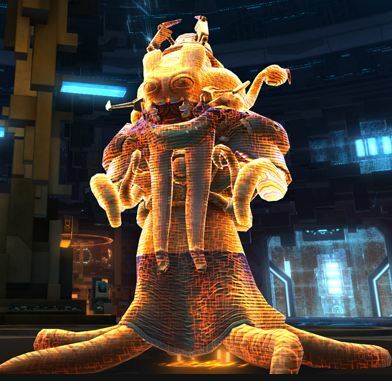 Star Wars lore tells us that the Gree are an ancient cephalopod species with multi-tentacled appendages. 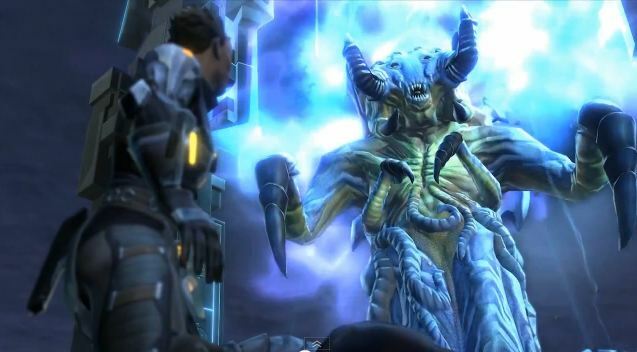 The image appears to be Bioware’s rendition of them. This encounter seems to be taking place in the same area as where the Gree hologram was standing. It may be that the Gree disappears and you are faced with these droids to fight. 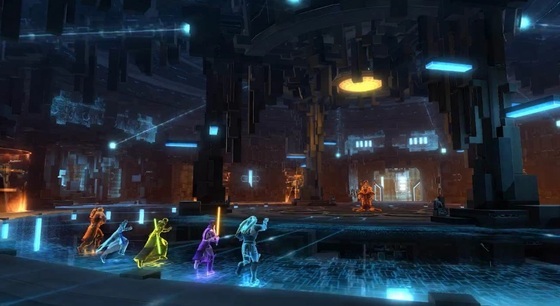 Or, perhaps, this immediately follows the Gree encounter as a separate fight altogether. Look closely and you’ll see three of them, two bipedal and one quadruped. It appears that the bipedal droids are being tanked while the big droid is being ignored or it may be being tanked as well. The angle makes it hard to determine for sure. The setup looks pretty basic so I hope there are some more tricks up these droid’s exoskeleton. The only other footage we have from the new operation is from this handsome fella you see above. Spawning out of some hell forsaken hypergate, this creature crawls out from the land of nightmares, torn out of the fabric of space-time, to materialize on the physical plane to do battle with our heroes! Actually, I have no idea where this guy comes from but he looks kinda cute. Now, this is what I call an battlefield! I can only assume that this is the final encounter in the Terror From Beyond where you fight the namesake. I see portals on various hovering masonry with teeny players spread out across them. In a previous podcast, Bioware said that they weren’t going to design anything as complex as the Soa encounter originally was but I really hope that this one is at least as challenging. The more mechanics that are involved the higher the difficulty. The higher the difficulty, the greater the satisfaction is when you finally down that boss! One point that was mentioned in the blog is something quote worthy: “Story mode will be available for players who just want to see the sights, but it’s no walk in the park.” I’m pleased to see that they aren’t going to make things easier just because it has a story mode tag to it. Bring it on, Bioware!